Action from City of Peterborough (red) v Old Loughtonians. Photo: David Lowndes. City’s dreams looked in tatters as they trailed visitors Old Loughtonians 3-2 with three minutes to go in an East Conference fixture at Bretton Gate. They were in such dire straits they pulled their goalkeeper and fielded a kicking back who promptly made a vital interception. The ball was quickly transferred down the other end where Danny Sisson scored with something resembling a tennis-style smash after a goalmouth scramble. A draw wasn’t likely to be enough so City pressed again and won a short corner seconds before the final whistle was blown. 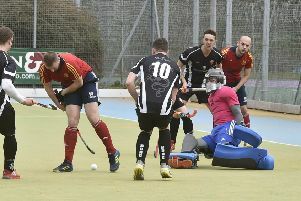 Hockey laws dictate a penalty corner must be completed before the game ends and City kept their cool and worked Cameron Heald into a shooting position and he calmly lifted the ball into the net to complete a famous 4-3 win. It means City go into next Sunday’s (March 31) final match at bottom club Cambridge City needing a win to have a chance of finishing in the top six and a place in a new National League Division One next season. City need three points to overhaul either Brighton or Teddington who play each other. If they draw City will need a big win to catch Brighton on goal difference. City struggled against Old Loughts and trailed three times. The visitors scored in the second minute, a lead they held until half-time. City rarely found any attacking fluency, but fortunately their short corner drills were in excellent order. Heald equalised following the same routine that delivered the winning goal and Adam Wilson also scored with a direct shot to make it 2-2.